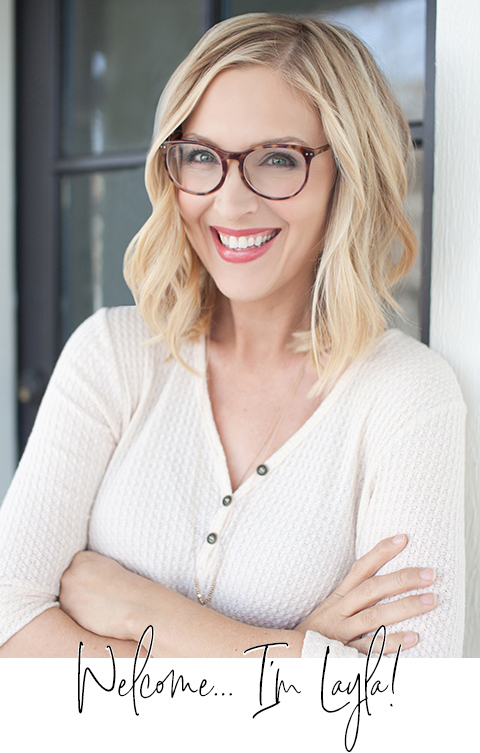 Hello- and welcome to our first “Spring Fling” link party! 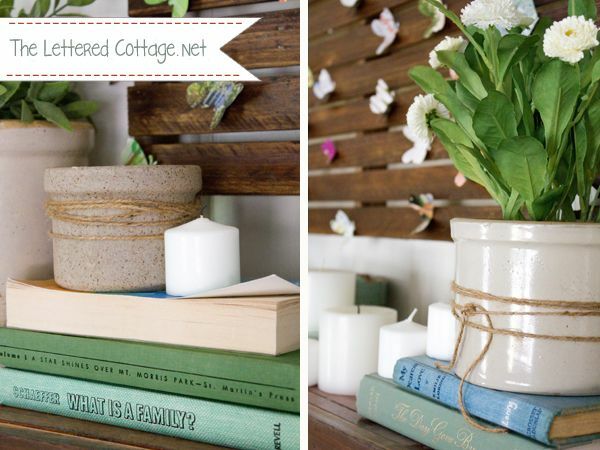 We’re kicking things off with a mantel/shelf/ledge link party here on our blog today, and Kate, Rhoda, and Sarah will be hosting some more Spring-themed parties on their blogs on March 22nd, 27th and 29th! I hope they live ’til Summer! We made the wood art out of some 1×2’s and some “fill-it” strips from the fencing department at Home Depot, and I stained it with a combination of leftover “Special Walnut” and “Provincial” stain we had from other projects. When the stain was dry, I used our electric hand sander to give it a little age. Next, I punched a whole mess of butterflies out of some old magazines I had, and I love the swoosh of Spring they add to the the room! I got the butterfly punch at Hobby Lobby ($14.99), and each paper butterfly measures about 2 inches across. To give the flock(?) 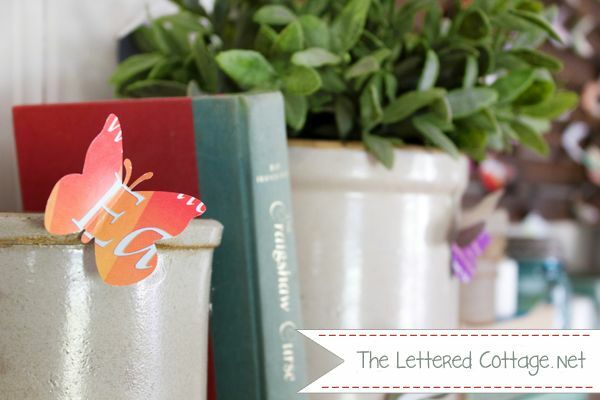 a little more interest, I made a handful of larger butterflies by enlarging one of the 2″ ones with my printer, and using it as a template to create some 3″ ones. The crocks have actually been up on our mantel since last Fall, and it’s amazing how versatile those suckers are! They were fun to mix with mercury glass around the holidays, too. And can I just say that all those vintage metal and leather bits drive. Me. WILD? Anywho, it was a super fun/super inexpensive display to put together, and we’re really enjoying the fresh new look in our living room! Alright! Let’s get this link party started! Thanks so much for partyin’ with us this week, and here’s to an amazing Spring! I love the spring mantle and that you reused some items and pulled in new items as well. 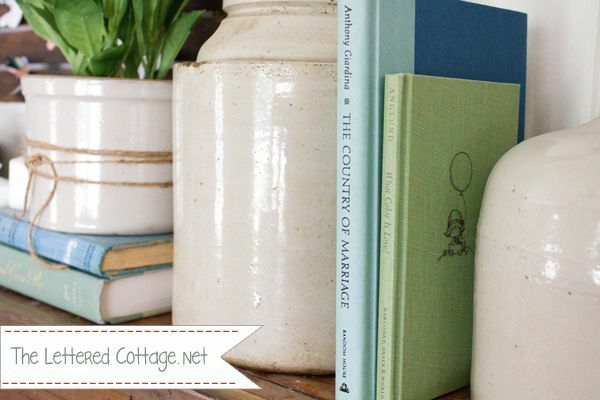 Where do you store decorative items when not being used? We are a military family and move A LOT! 5 times in 8 years thus far. I always have items that don’t end up being used in one house or another but they stay in boxes and sometimes I forget what I have…any thoughts? Thanx for hosting Layla! Loving your mantle! Thanks for hosting, Layla. Your mantel is very pretty and I especially like the crocks. The butterflies are adorable too. Wow! What a great party! I can’t wait to visit the other posts and see all of these great mantels up close! Thanks so much for hosting!! Glad to link up! Love your butterfly art! It’s so gorgeous and creative! Thanks for sharing and for hosting this party. 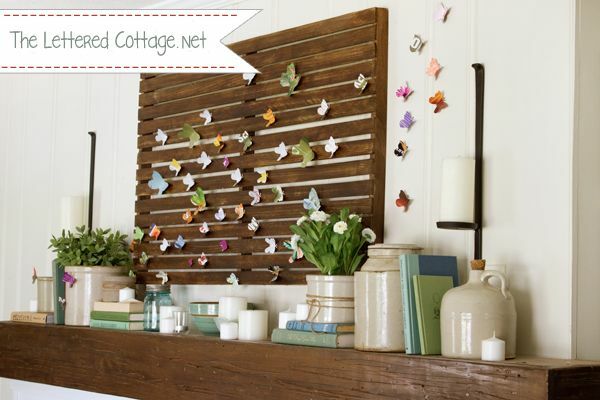 Oh, what a cute springy mantel you’ve put together! I love those butterflies. Thank you for hosing your fun party! Thank you, thank you, thank you! My mantle has been sadly lacking, and I really had no idea what to do with it (it’s my first time having a mantle, so other than housing a clock and some candles it’s been obscenely bare). I have so many ideas now! YIPPEE!!! Who can go wrong with crocks?! I used to go to auctions all the time before I had three children to tow along, and I was ALWAYS so happy when I got the winning bid on crocks! What a great idea of using the old crocks with the new look of the colorful butterflies. I LOVE, LOVE, LOVE how you use such inexpensive ideas and make it look so expensive! Thank you!! So gorgeous! You are talented. Beautiful! I love your butterflies and your pallet. Also, love the very real looking plants from Ikea (I love that place!). I am fashionably late to your party. : ) You have done it again! Your mantel is full of whimsy and the promise of spring’s magical moments! I adore your butterflies. (I had to share your post with my mother because butterflies are her favorite!) 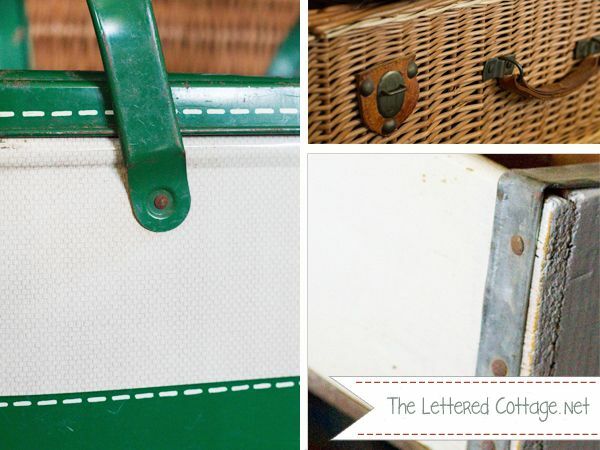 The inherited family crockery, the ‘antique’ crate and the enamel picnic basket — wonderful details that hold my attention. What a fun party! Thanks for hosting! I’ve linked up! 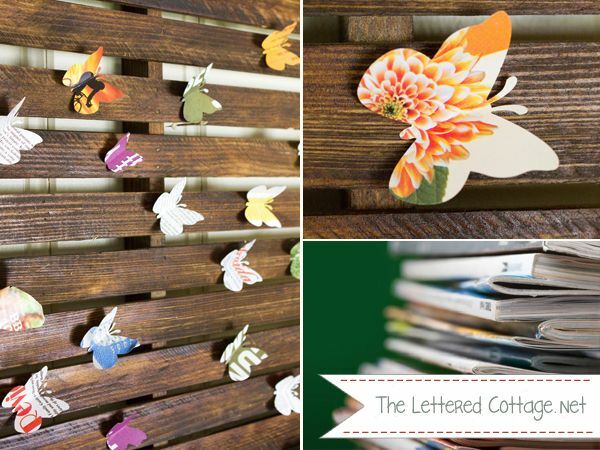 What a fun idea to use butterflies. Very unique. I love the touches of twine you used, too. Thank you for hosting!! This was fun- a good reminder to me to do something different with the mantel- and I love seeing what everyone else did as well. I love your butterflies and picnic baskets!! Love it Layla!! I just got several crocks from my mother in law, I’ve had fun using them in different ways!! 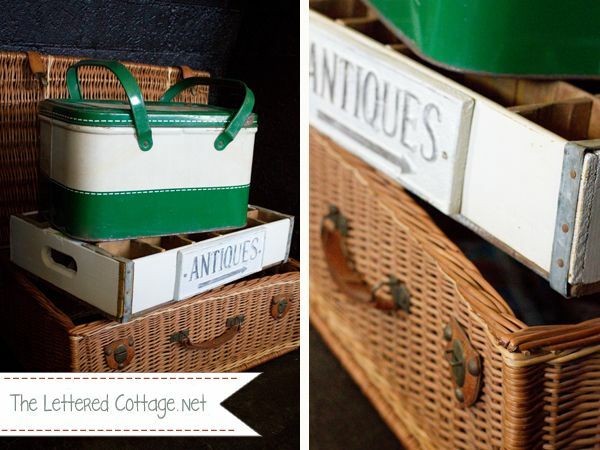 Love that you used your vintage picnic basket, I have that exact one, plus about 15 more…I’d love to see people using them in different ways. Right now I have them just stacked here and there…between my mom and I, we have a huge collection! hi! i just linked up for the first time – thanks for hosting this, i just love looking through all the eye candy! I’m going to have to look at each mantel in your party. I just can’t get mine to look the way I want so these will all be inspiration. Yeah, I’m linking mine anyway since the only reason I hopped to it was to join the party! I joined the fun, thanks! Thanks for hosting! Can’t wait to go through the fantastic inspiration! 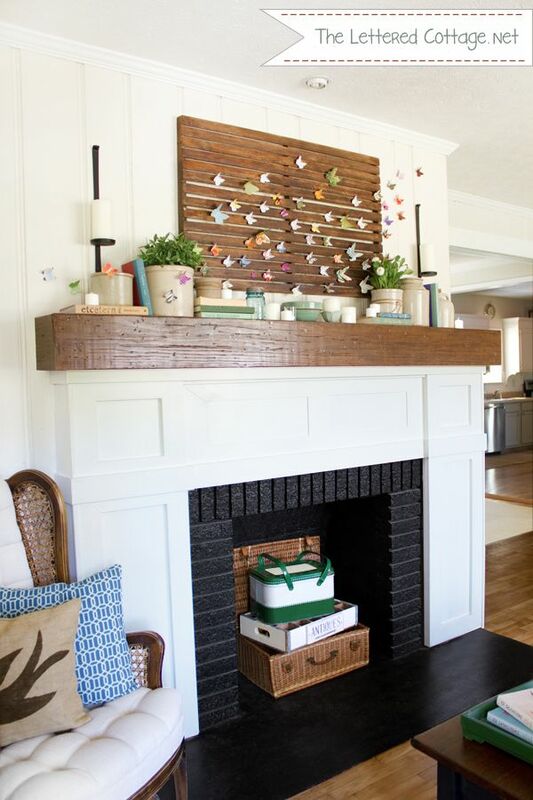 Layla, I love your mantel, do you show how you guys attached it on your blog somewhere? I saw the post about how you created the whole fireplace but wondering more about how the mantle was created and attached. I love your Spring Living Room! The butterflies are super cute. Something that I never would’ve thought of. You’re just so creative. I love all your work. I linked up late (story of my life…#293, holy snikers! ), and mine’s not technically a “mantel” because I don’t have one (sniff, sniff). It’s a spring sofa tablescape. Feel free to delete it if you feel it’s not appropriate. I almost missed the party but happy to be linking up my vintage-inspired Easter mantel (341). I’m off to check out all the other inspiring spring mantels. Yours is so happy! The butterflies are a lovely touch and how nice your mom loves to ride her bike. I just overhauled mine last summer and can’t wait to get out on the trails myself soon. Thanks for hosting and have a nice week. Just in the nick of time! I new I wanted to share my mantel in your link party, I just never thought it would take me so long to get it posted. I am totally loving how your mantel turned out. If you have any hints on how to work around a big, wall mounted tv, I would greatly appreciate them. The mantel is always the spot where i get stuck. hope your week is off to a wonderful start! I love your mantel! It’s dripping with butterfly sweetness! I’ve been reading your blog for years. I LOVE it! This is the first time for me to linkup. I was third from the last! I almost didn’t make it! Thank you for hosting! Oh no! Can I still sneek in? Pretty please? I love all the butterflies. I need to go buy a paper punch to try it out. When I do I will send you my picture. This is my first reply SO excited. Just looking over some of your pics — I almost cried when I saw Edith Schaeffer’s “What Is A Family” book on your spring mantle. It’s my second favorite book of all time, after the Bible. Have you read it? I even did a college paper on it!